Modern technologies do not stand still, they’re constantly evolving. 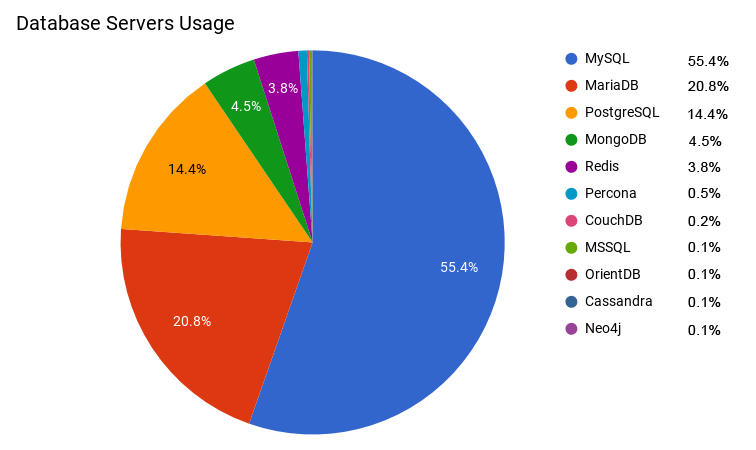 We analyzed the current statistics of engines, application servers, databases and plug-ins under a magnifying glass, revealing which stacks are the most rated and more actively used. Let’s get acquainted with the detailed report based on the choice of Jelastic PaaS users. Jelastic cloud platform provides support of Java, PHP, Ruby, Node.js, Python, .NET and Go. According to the statistics, the customers choose mainly two leading programming languages. The latest research shows that PHP shoots ahead with 58.3%, and Java has 33.1% of customers choice. 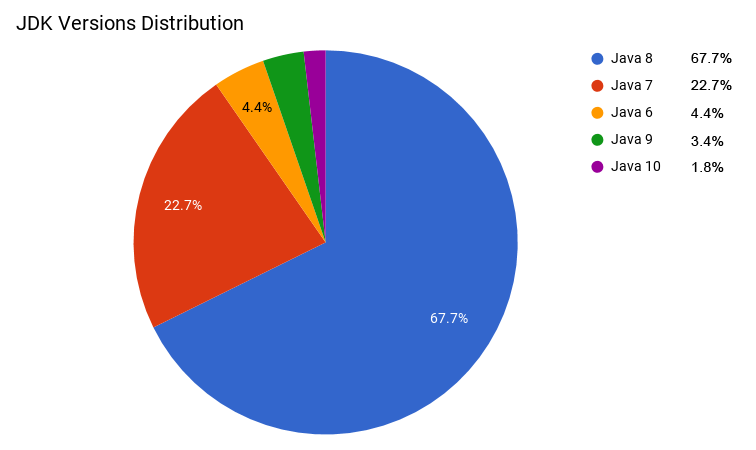 The rest programming languages get much less distribution (8,6% in total) but the situation can change. 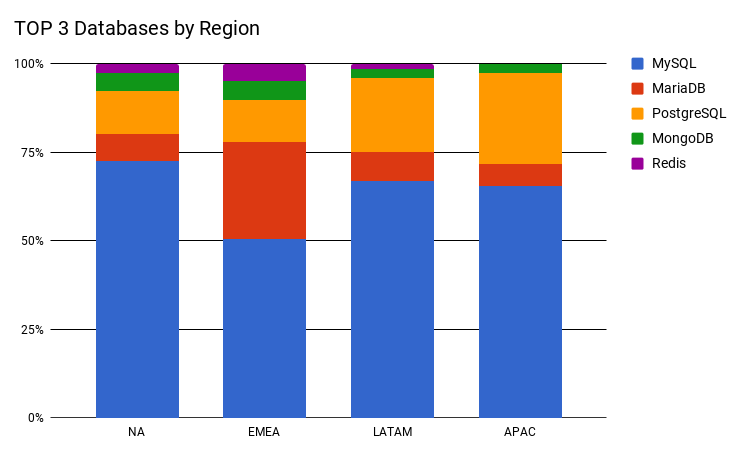 The statistical data that was gathered on the geographical spread of the engines, showed that customers from the Asia Pacific (APAC) mostly use Java for their applications. On the other hand, users in Europe, Middle East and Africa (EMEA), as well as Latin America (LATAM), give their main priority to PHP, and in Northern America (NA), the percentage is approximately the same. It is noteworthy that Node.js is used approximately equally in all regions, while Ruby is more popular in Latin America. PHP is considered one of the easiest to use server-side scripting languages. 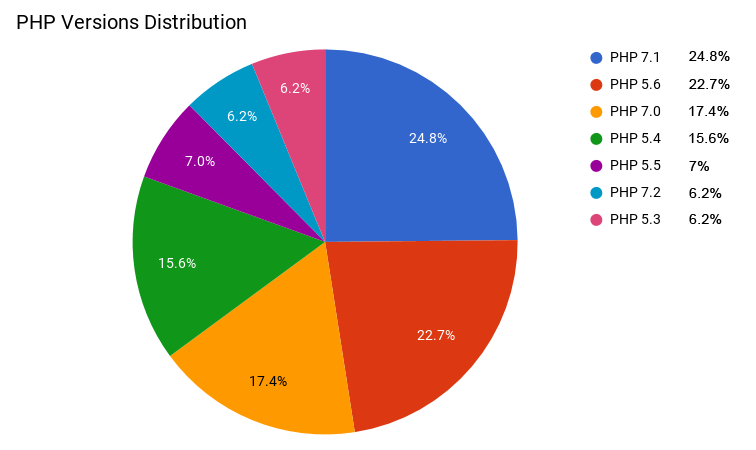 Most of the Jelastic PHP users are running their projects on v7.1 (24.8%) and v5.6 (22.7%). Versions 7.0 and 5.4 have also high rates, 17.4%, and 15.6% respectively. Java enables the development of secure, highly performed, and robust applications in heterogeneous, distributed networks. So that is why it’s one of the most widely used programming languages among enterprise projects. On the graphic below you can see that the majority of Java environments in Jelastic PaaS were created with Java 8 (67.7%) and Java 7 (22.7%). Java 10 that was just recently released, already gained 1.8% and actively growing. Comparing PHP and Java, we can see that Asia Pacific countries commonly use Java. Northern America almost equally likes both of them. While others (EMEA, LATAM) prefer PHP programming language. Taking into account that PHP and Java are the leading programming languages, that’s not a surprise that Apache and Tomcat are the most demanded among other application servers. 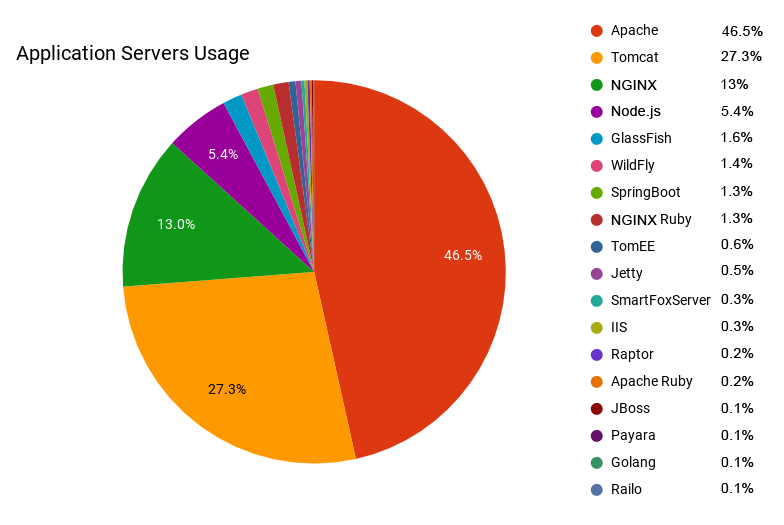 46.5% of users installed Apache PHP for running their environments, and 27.3% chose Tomcat hosting. NGINX attracted 13% of customers. And the rest of the servers (Node.js, GlassFish, WildFly, SpringBoot, NGINX Ruby, TomEE, Jetty, SmartFox Server, IIS, Apache Ruby, JBoss, Goland, and Raptor) got 3.2% in total. 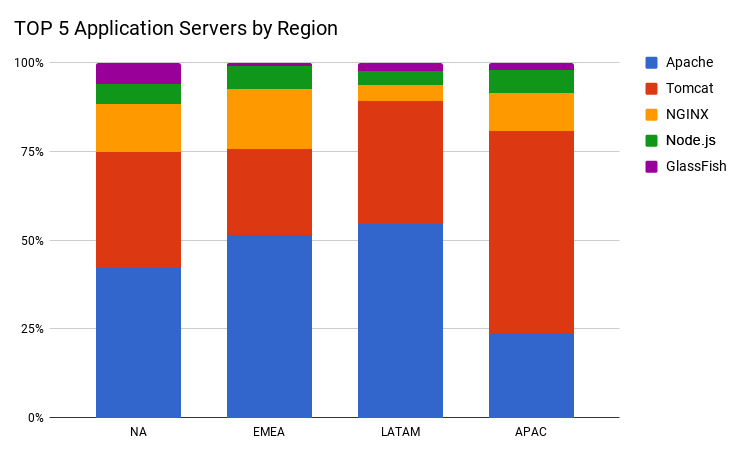 The geographical situation with the servers spread is similar to the engine usage: Tomcat is widely spread in North America, LATAM, and the Asia Pacific, while Apache is mostly popular in EMEA and LATAM countries. Let’s find out the database servers usage. From the chart below, you can see that MySQL got the 1st place with 55,4% of installations, moreover, the number is growing, especially considering an easy way to install it with already pre-configured replication. MariaDB (20.8%) and PostgreSQL (14.4%) hold respectively the second and the third places. The fourth goes to MongoDB with 4.5%, while the rest database servers (Redis, Percona, Microsoft SQL, CouchDB, OrientDB, Neo4j) share the remnant of user’s favor. 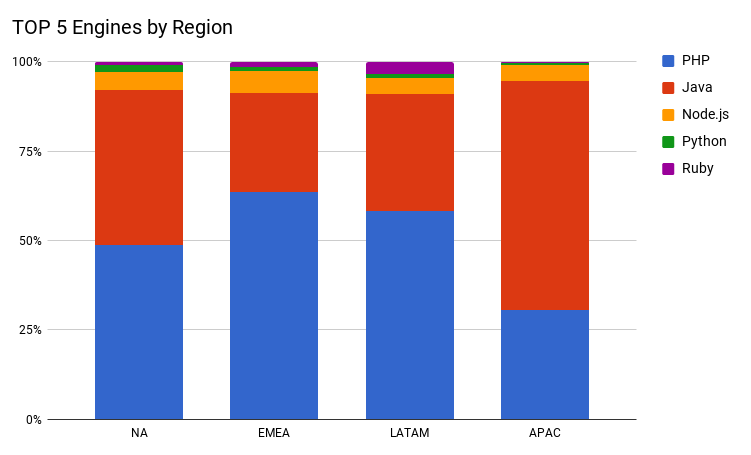 Considering the distribution by regions, we can highlight that MySQL is popular in all parts of the world, especially in North America. MariaDB is in the tops in EMEA and keeps wide-spreading. 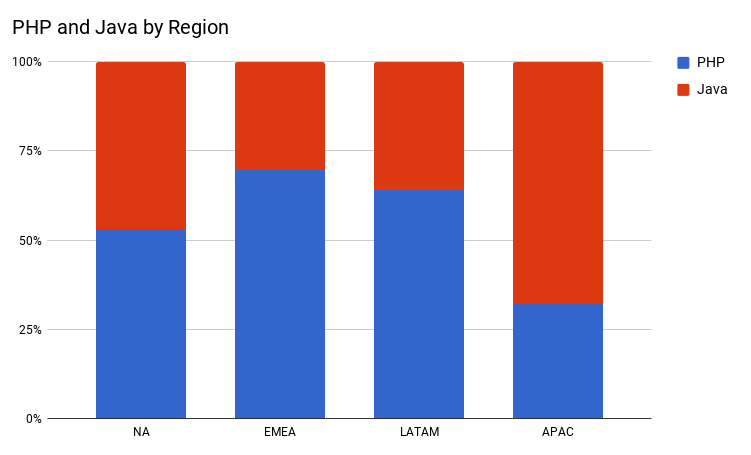 PostgreSQL is more or less evenly distributed with the highest results in APAC. 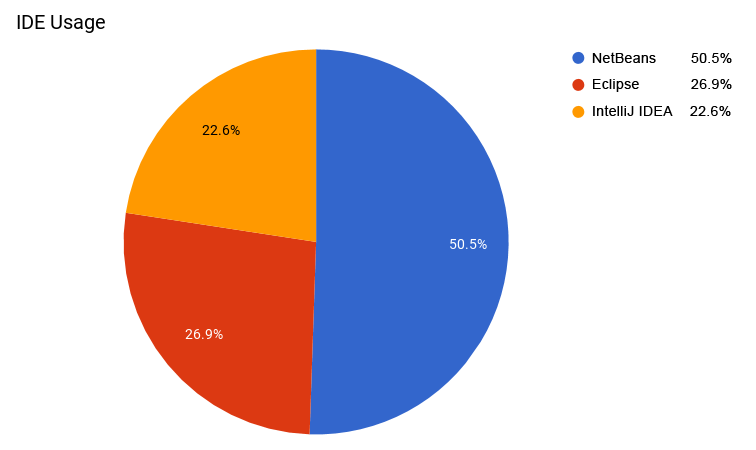 As it can be viewed in a picture below, more than a half of our clients (50.5%) prefer to build their projects in NetBeans, a bit less than a third part (22.6%) write their code in IDEA, and the rest (26.9%) choose Eclipse. Jelastic provides a marketplace of ready-to-go applications, clusters, and add-ons built with own packaging standard. Such pre-configured solutions are automatically installed and require minimal to no involvement in the further management and support. If you’re looking for a reliable cloud hosting with a wide choice of supported stacks and production-ready solutions, you’re welcome to create your own environment with the needed topology configurations via Jelastic intuitive UI. Just choose your favorite stacks, set the vertical and horizontal scaling rules and go ahead. We’re sure you’ll really like the simplicity Jelastic PaaS provides for developers.